The 3-star Hotel Mignon in Riccione is a family hotel located on the seafront with specific services aimed at families with children, a discounted entrance to the Beach Village water park and a rich entertainment program. Accept animals of all sizes. 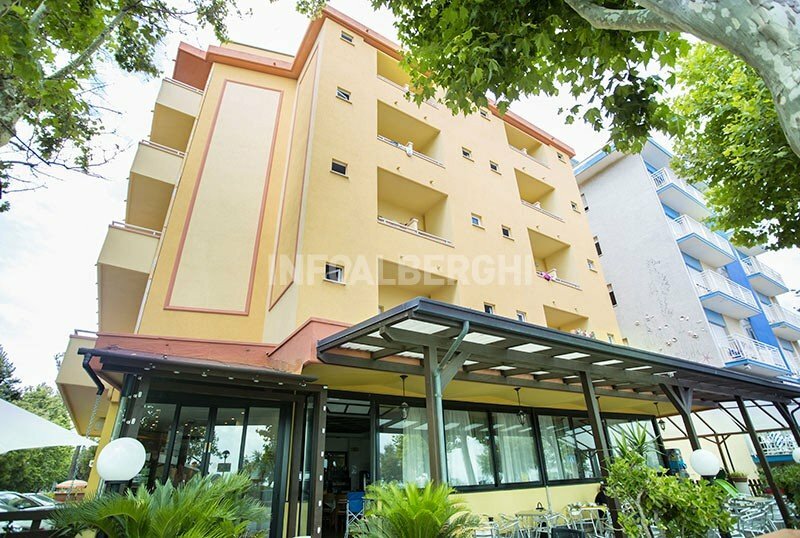 The hotel is located in front of the beach, on Riccione's seafront. It is about a 5-minute walk to the Beach Village water park, which has an agreement with the property. Not far away are Viale Dante, full of shops, and the city bus stops with which you can reach the city center and the station in less than 10 minutes. All with balcony (most with sea view), air conditioning, free WI-FI, telephone, safe, TV (satellite or terrestrial digital), bathroom with hairdryer and shower box and minibar on request. FAMILIES: communicating solutions and family rooms with independent entrance are available. APARTMENTS: the hotel has 50 sqm apartments for families or large groups, they are composed of 3 rooms, terrace, TV, private bathroom with hairdryer and fan. Garden, terrace, relaxation room and TV, playground areas for children. Theme nights are organized. PARKING: near the structure and with limited places (free during promotional periods). CONVENTIONS: beach, amusement parks, discos, water-slide (Beach Village), shuttle service (airport / station, on request), organized excursions. BREAKFAST: international buffet, also served in the garden with sweet or savory pies and homemade pies. LUNCH AND DINNER: served in the panoramic, air-conditioned restaurant. The restaurant offers a choice of 4 first and second courses of meat and fish, buffet of appetizers and vegetables and a wide selection of wines. Pasta and desserts are homemade. VARIATIONS: the menu includes vegetarian dishes and the kitchen prepares gluten-free dishes for celiacs. OTHER: the staff organizes themed gastronomic evenings, evening aperitif on the terrace every Sunday and parties with live music. In the hotel: games corner in the garden and indoor playground area "La casa di Masha" with games and educational games, TV and videotapes. Baby / mini / junior club with live entertainment, strollers and bicycle seats. Babysitters and pediatricians are available for a fee. In the room: cots, anti-fall rails and tubs. Baby-monitors, bottle warmers and changing tables are available on request. At meals: children's menu and flexible meal times, table seats, baby food and baby food. On the beach: live entertainment, playgrounds, changing room and hot showers. Other: the staff organizes themed birthdays and personalized dinners in the garden. The hotel has an agreement with the equipped beaches Bagno Cristian 123, Bagno Elio 122 / B and Marano Beach 136, with entertainment, cabins for children and sports fields (beach volleyball, beach tennis, bocce). At the Marano Beach, a swimming pool for adults, a baby pool and hot tubs are available for a fee.